This card has a similar counterpart called Chimeratech Fortress Dragon. Whereas all of the Cyber Dragon Fusions with Cyber in their name are LIGHT Attribute, all 3 known Cyber Dragon Fusions with Chimeratech in their names are DARK Attribute instead. Similarly, while all Cyber Dragon cards include the phrase Evolution Burst in their attack names, both Chimeratech monsters include Evolution Result instead. Both this card and Chimeratech Fortress Dragon originate from the 'Chimaera', a mythical beast who had the head of a lion, goat and snake. More recently, 'chimaera' refers to the idea of combining things that occur naturally, much like both monsters are fused from varying Machine-Type monsters. Their design may also be based on the Hydra or the Orochi. It also similar to that of Five-Headed Dragon; both are multi-headed monsters that require multiple Fusion Material Monsters of their Type to Fusion Summon. Chimeratech Overdragon is the only Cyber Dragon Fusion Monster where all the heads are the same. 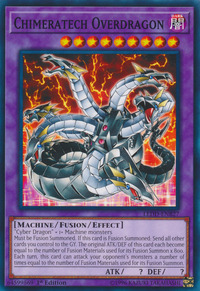 In the anime, this card is depicted as having a head for each monster used in the Fusion Summon (e.g. six heads in its first appearance). It could also attack as many times (including direct attacks) as the amount of monsters used to play it; the TCG/OCG counterpart does not apply this to direct attacks. According to this depiction, the official TCG artwork of Chimeratech has an ATK and DEF of 6800 or 4,800 since it has 6 heads. This is the cover card Yu-Gi-Oh! Tag Force in the pack wave from the future"
This card is the first Fusion Monster to have a variable number of Fusion Materials. The "The original ATK and DEF of this card each become equal to the number of Fusion Material Monsters used for its Fusion Summon x 800." effect is a Continuous Effect. The ATK of "Fog King" is the combined original ATK of the Tributed monsters after they were Tributed. If "Chimeratech Overdragon", "Megarock Dragon" or "King of the Skull Servants" is Tributed, "?" ATK is treated as 0, so "Fog King" will have 0 ATK. : When Tributing a monster whose original ATK has changed - like "Megarock Dragon" - for "Fog King", what does the ATK become? If "Jinzo" and "Jinzo - Returner" are sent to the Graveyard simultaneously by "Future Fusion" to Special Summon "Chimeratech Overdragon", you can activate the effect of "Jinzo - Returner" and Special Summon the sent "Jinzo". : When "Jinzo" and "Jinzo - Returner" are sent to the Graveyard simultaneously, can "Jinzo" be Special Summoned? If a "Chimeratech Overdragon" that was Fusion Summoned using 3 monsters as Fusion Materials is targeted by "Shrink", its original ATK (2400) is halved (1200 ATK). When the turn ends, the effect of "Shrink" is no longer applied, and the ATK of "Chimeratech Overdragon" returns to 2400.: If "Shrink" targets "Chimeratech Overdragon", what happens to its ATK? 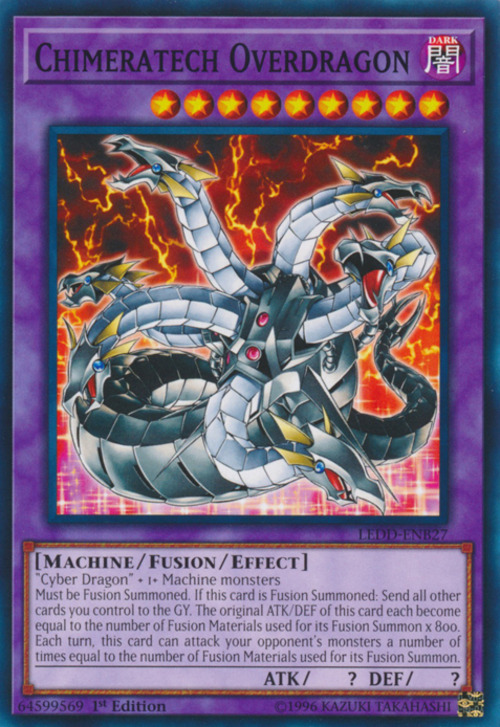 When you Fusion Summon this card you can use a substitute, such as "King of the Swamp", for the "Cyber Dragon", but not for the Machine-Type monsters. That means you can use a maximum of 1 substitute monster in the Fusion Summon. The effect that sends all your other cards to the Graveyard is a Trigger Effect and it can be chained to. "Chimeratech Overdragon" can attack the same monster more than once if the attack target is not destroyed, such as an Attack Position "Spirit Reaper". If "Chimeratech Overdragon" attacks directly, and then the opponent Special Summons a monster during the same Battle Phase it cannot attack it. You can activate "De-Fusion" and target "Chimeratech Overdragon", but you can only Special Summon the Fusion Material Monsters if you have enough vacant Monster Card Zones for ALL of the Fusion Material Monsters you used. Revoke Fusion: You cannot Special Summon a Fusion Material Monster that is not specified by name. Example: You cannot select "Chimeratech Overdragon" with "Revoke Fusion" and Special Summon a "Blowback Dragon", but you can Special Summon a "Cyber Dragon". Shrink: If “Shrink” affects a monster whose original ATK is set by its effect when it is Summoned, like “Maju Garzett”, “Chimeratech Overdragon” or “Megarock Dragon”, that monster’s ATK will become 0, and remain 0 even after the effect of “Shrink” wears off.